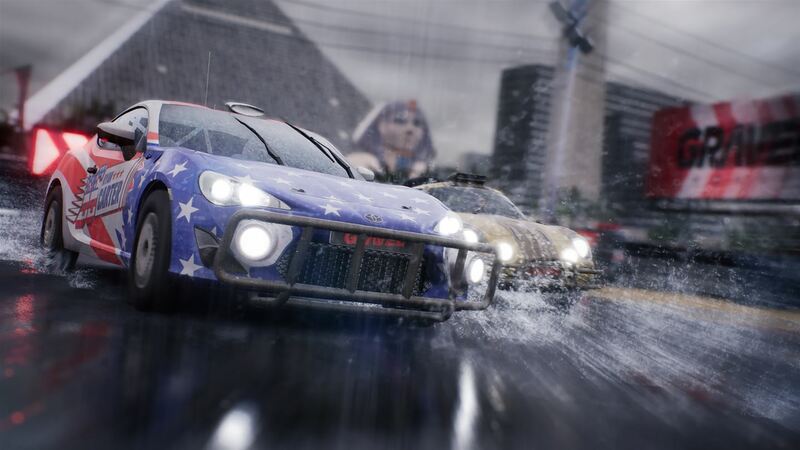 Gravel is the latest in a long line of racing games to come out of the Italian studio, Milestone. I think it’s fair to say that none of the games that have been released so far have Forza fans worried, but given their penchant for off road adventures with the WRC titles, surely Gravel is the game that they have been working towards all this time. Isn’t it? Straight out the box and initial impressions are good. The presentation of the game is that of a dedicated off-road racing channel, called Gravel Channel. You know, the sort of channel that you find at the top of the Freeview numbers, offering non-stop spills and thrills, just this time revolving around the muddy world of off-road racing. The channel is hosted by a man who always seems to be over excited about the prospect of the racing that is in store, promising heart stopping action and so on. While this is overstating things, it does fit in with the feel of the channel overall, and as his ramblings are limited to the start and end of the races, he doesn’t overstay his welcome. I imagine if he had commentated all through the races, the volume would have had to be lowered somewhat. So, Gravel itself is divided up into four disciplines. These are Wild Rush, which is usually a circuit based race out in the wilds, the point to point Cross Country, Stadium Racing, which is a spectacular mix of circuit racing and stunts, with multiple jumps and Speed Cross – a version of Autocross taking in circuit racing on tracks that are made up of dirt and tarmac. 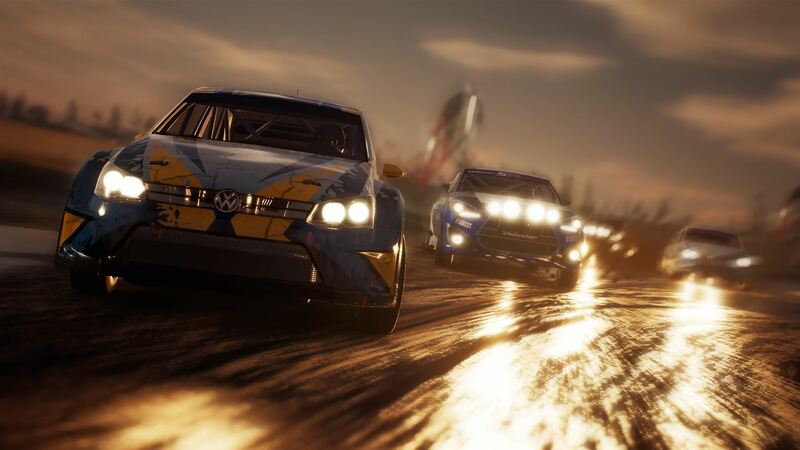 There are different types of races within these disciplines as well, from straight time trials where you have to be faster than the rest of the field over a course – which is the closest to a straight Rally type race there is – to a unique race style, called Smash-Up. 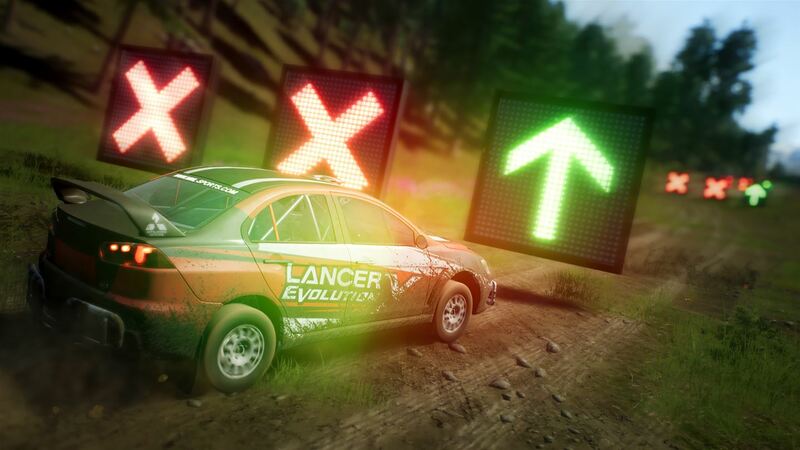 Smash-Up races require you to drive either the circuit or the track, and every so often signs will pop up, showing either a green tick or a red X. The idea is that the car has to pass through the green tick, or it will be slowed by hitting a red X. Given that the order of the boards seems to be random, it makes the race a completely different animal. Quite often the green ticks are not on the racing line, so the tracks you’ve learned then require unlearning, and it can be hard to see where the boards are at night. These races seem like an attempt to bring something new to the racing genre. Races can take place at night or during the day, whilst changeable weather can make an appearance, with events taking place in the rain or in a blizzard, for instance. Obviously, weather conditions have a big effect on the racing, with wet tarmac being particularly treacherous, requiring a change in driving style. Strangely, wet tarmac turns out to be even more slippery than snow, which seems a bit odd when based on my real-world experiences. Graphically, and Gravel is a strange mixture of visual styles. The scenery, particularly on the Alaskan and Namibian stages, is absolutely beautiful, with draw distances almost to the moon, and a massive amount of detail. The fireworks that go off on the night stages as you approach a jump are spectacular, and the overall feeling is one of being out there in the wild. Conversely, those for the cars themselves are a strange mix of detail and broad brushstrokes, with the cars seemingly rendered from a much lower polygon count than the rest of the world; when you get up close and personal with the other cars (and you will) you can see the fans spinning on the radiators on the back of the Trophy Trucks, for instance. The car models that you can see seem to be made up of fairly slab sided rectangles with wheels under them, and there just isn’t the amount of detail that you would get from something like Forza 7 for instance. The audio is similar with the engine sounds coming across as fairly standard and bland. Each car seems to sound like every other car, and there doesn’t seem to be any difference between a petrol four-cylinder engine and a diesel eight cylinder. In fact, most of the cars put me in mind of a hair dryer being used in another room – a kind of hum that can easily be ignored. When it comes to actual gameplay though, the guys at Milestone have got this one sorted out. The biggest takeaway I had from a session of playing Gravel was fun; it is a very enjoyable game to play. Sliding around corners, ramming other guys out of the way, and taking the win by a hundredth of a second gives a pure racing high that is hard to beat. The different race types also help with this, keeping the gameplay fresh by mixing things up and keeping you guessing as to what is coming next. In Career mode, there are five “bosses” to beat before you can claim the Gravel crown (that sounds like a really uncomfortable hat, but never mind). Each of the various disciplines has a champion, and as you work your way through the game you can challenge them and take their title. 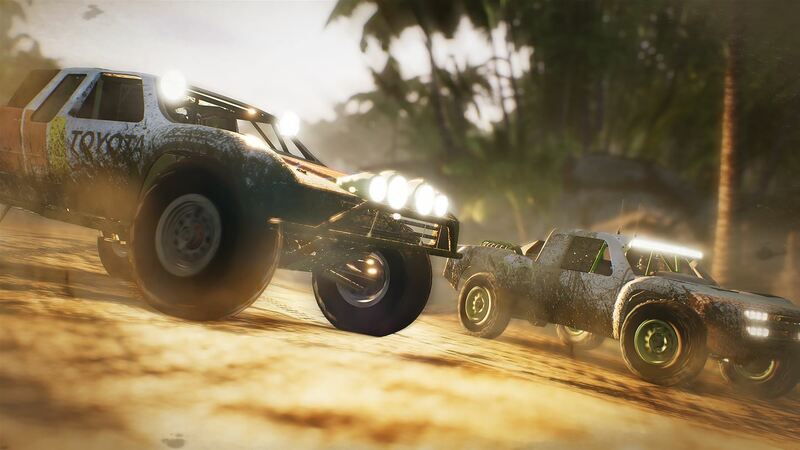 Once you have beaten all four “mini- bosses” and have earned enough stars from winning races, you can challenge the Off Road Master. Each boss has an intro video and a whole backstory, so the amount of work that has gone into building a credible narrative is impressive. I’m not convinced it’s entirely necessary for a racing game mind, but it’s nice to see care being taken. In addition to the Career mode, there are the usual options available, from a single race, with the class and car chosen by you, to Time Trials, which does exactly what it says on the tin. Online racing is also available, and seems to be quite well populated, with little difficulty in getting an opponent to challenge. In an interesting move, if the lobby isn’t full, the rest of the grid is made up of AI racers, which ensures that the races are always full and interesting. Track choice and race type is open to voting as a default, but these parameters and more, including the AI difficulty, can be tweaked in the lobby settings. The multiplayer works well too, with no noticeable slowdown or glitching even when playing with others from around the globe. All the disciplines from the Career mode are here to be chosen from, so it is usually possible to get a race in your favourite class or track. However, there is a but coming. And it’s a big old but. Gravel feels almost unfinished, presentation is rough and unpolished, and there are various glitches and oddities to overcome. These range from the trivial camera glitches that see bumper cams clip through the floor, to major issues that see cars getting stuck together. 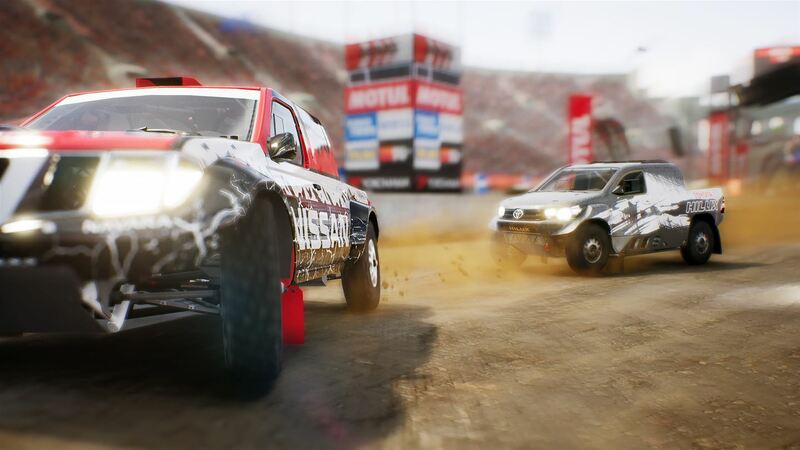 The glitches move up the scale, from the weird, such as road side cones – which in every racer since the PS2 have been destructible – having sufficient structural integrity to allow them to support a trophy truck landing on them after a jump, to trackside walls seeming to be magnetic. Seriously, on some tracks, the walls seem to pull you in, and then a seemingly smooth wall can suddenly stop, spin and even flip your car, when it clearly should have glanced off and let you carry on your merry way. The most annoying issue however is the way that Gravel deals with collisions between the cars. If you crash into the back of a competitor, and you will as the AI seems to swerve into your path at every opportunity, it is common for the cars to “lock” together, so you can’t get away from them. And the icing on that cake is the car you hit slows you right down, despite the laws of physics saying its speed should increase if a faster object hits it from behind. Hitting cars side on is a gamble as well, as sometimes you’ll just bounce off and carry on, whilst at other times you’ll spin out or flip. Add in some questionable track design choices, like the placement of a jump just before a 90 degree corner, and the game can be somewhat annoying. Furthermore, night levels require a rabbit’s foot in your racing pants, as instead of headlights it appears that some sickly fireflies have been glued to the front of the car, and the headlights stop just 6 feet in front of the car. And that’s not even mentioning that at the end of each race the game dumps you back out to the competition selection, instead of going to the next event like… ooooh, every other racer in the world? There are more, but you get the point. All in all, Gravel, despite its best efforts, isn’t a bad game. It’s rough, annoying, hard on the eyes (seriously, the lens flare on the dawn levels are based on no planet I’ve ever seen), and unpolished. But it is still fun to play and for a quick and dirty arcade session, there is a lot worse out there. The overall impression is one of enjoyment, and as such, whilst it is something I can’t wholeheartedly endorse and recommend to you, I can suggest you give it a try. Deep down there is a good game struggling to get out.